I probably should have actually tucked this in with the "week 3" issues, as this 1. does not end on white pages and 2. takes place prior to events seen in "week 4." C’est la vie…I put this issue almost at the end of stuff because of it being a "retroactive tie-in" published a decade and a half AFTER the actual series. 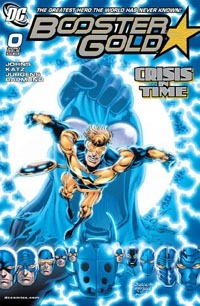 This issue sees Booster Gold and the Blue Beetles travel through time, and cross paths in the timestream with Parallax (Hal Jordan) and Extant (Hank Hall) circa Zero Hour, 1994. Parallax damages their time-bubble and they’re forced into the 25th Century (with no need to chase down the time-trouble-makers, as they’ve already been dealt with IN Zero Hour–oops, we’ll see that shortly). Turns out the exact day the group emerges in is the day that Booster "threw" a football game and was caught doing so. While striving to ensure that this timestream is not disrupted, they use resources available to continue their own mission and we learn a bit more about Booster’s background as well as the Blue Beetle (several of ’em!) before things have to be dealt with–like putting Dan and Jaime back in their own times without any memory of this issue or the previous having happened…and Ted’s poised to be another "Hero You’ve Never Heard Of" alongside Booster… it’s Blue & Gold, reunited! Though the two quickly realize there’s a bit of a Brother Eye problem that may end things before they’ve truly begun. This issue was actually published in 2008, some 13 1/2 years after Zero Hour. We were post-Infinite Crisis, post-52, mostly through Countdown, heading toward Final Crisis. And in the early issues of the Geoff Johns run on Booster Gold, with art by Dan Jurgens–the character’s creator and Norm Rapmund‘s excellent inks. And I recall this being one of the more fun series at the time, certainly one of my favorites. 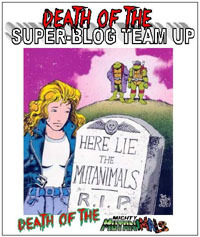 In fact, I had covered the issue at the time, for comiXtreme (and republished in this blog years later), and rated it quite highly. That particular review was based on the issue in that context rather than as a random issue added to this mix, hence any discrepancies between then and now. Ultimately (given the 14-year-gap in publication) this issue does nothing for the understanding of Zero Hour itself, moving the 1994 series along, etc. But this makes a fun tie-in and providing a more grounded "time" to touch base with–a nod to older/longer-time readers–while serving its own story. This issue actually kicks off the second arc in the Booster Gold title, and leaves me quite interested in re-reading it…unfortunately, I don’t believe I have any of the early collected volumes, nor ready access (consolidated) to my singles at the moment. I don’t recommend this in context of Zero Hour itself, really, but it was a great throwback issue, touching in continuity and playing off the #0 issues concept (this was the seventh issue of the series). But as a Booster Gold story, I very definitely recommend the Blue and Gold arc that this kicks off, as well as the first one, 52 Pickup. It’s hard not to sound like a broken record…but I find myself enjoying this title more than just about any other monthly out there. It’s been a consistent high-hitter…great story, great art, and character dynamics that remind me why I enjoy super-heroes in the first place. This issue we begin to see some major fallout in the timestream due to Booster’s rescue of Blue Beetle, and see the two interact with characters in a present that’s been altered by Beetle not having been killed by Lord when he was supposed to have been. Additionally, further light is shed on the mystery Beetle, as well as the Supernova subplot. Though it seems like Infinite Crisis just finished, it’s great to see its earliest events being revisited in this context, as we see how things could have played out. That our characters are playing in the time-stream adds to the enormity of events that unfold, while also keeping them contained to this book without having to run around buying a bunch of tie-ins to "get" the story. The writing is spot-on as usual, capturing the attitudes of the characters seen, and continue to remind me what a great matchup Booster and Beetle are–maintaining a sense of humour as the two deal with each other and outside events, while not feeling forced (nor like some vain attempt to recapture a bygone tone from two decades ago). The art is also very strong, keeping everything clear, consistent, and in some ways fairly iconic. I not only have no complaint with the art, but feel that it’s set a visual standard for these characters against which I’ll find myself measuring any other appearances they make elsewhere in the DCU. This is the second issue of the Blue & Gold arc (the first was #0, a play on the Zero Hour "Zero Month" the arc tied into)…and as such this may not be the best point to jump on-board. However, if you track down that #0 issue…I highly recommend jumping in with this title (and consider the upcoming collection of the first six issues). As far as DC super-hero titles go…this is one of the best-written, most dynamic and interesting books I can see, and is my favorite DC is currently publishing. You know a book’s good when your primary complaint is a total fan-boy nit-pick with the issue’s cover. As a Zero Hour tie-in (complete with replacing "#7" with "#0"), I had honestly hoped to see the Zero Hour logo on the cover, making the cover fit in with the old 1994 zero issues. We do get the sharp silver coloring in the logo, which keeps it from being a complete bust. As Booster and the Beetles discuss where to go from here, they encounter fellow time-travellers Parallax and Extant, circa DC‘s Zero Hour: Crisis in Time story from 1994. After a battle with the villains, the heroes find themselves stranded in the future–specifically at a day Booster remembers all too well. They scramble to salvage their mission, while Booster contemplates his role in affecting Time, and an even larger threat quickly becomes apparent. Visually, the artistic team–Jurgens, Rapmund, and Hi-Fi on the colors–deliver an excellent product. The Blue Beetles, Booster, even the Zero Hour villains all look spot-on, and really look just about the best I’ve ever seen ’em. Right now, I’d have to say that Booster Gold is by far my favorite super-hero book out there. It’s smart, it’s funny, it’s serious…it builds off established continuity without being slave to it, and still has plenty of room to keep pushing the characters’ stories forward and open up new territory. This issue kicks off the 2nd arc of the title, and makes a good jump-on point if you’ve been considering whether or not to pick up the book. Both as something "new" to check out or as a continuing purchase, I highly recommend this issue, and the title in general.